Bhisha is a Khajiit agent living in Crucible, New Sheoth who likes dogs. Unfortunately, the only dog in Crucible is Ushnar gro-Shadborgob's, who is afraid of Khajiit and cats, and asks the player to make Bhisha "disappear" as part of the quest Ushnar's Terror. From when he wakes up at 6am, until 6pm in the evening, Bhisha will be on the lookout for Ushnar and his dog, and will obsessively follow them both all day long; unfortunately, Ushnar will take quite a few turns to avoid the stalking and will hide inside several houses during the day, which means that Bhisha will only follow him between 6am and 10am, and again between 3pm and 4pm. At other times, Ushnar will be inside a building and Bhisha will have to wait for him outside. At 6pm Bhisha finally stops his stalking, finds himself an available stool and takes a one-hour dinner before he enters the Sacellum Arden-Sul for a two-hour prayer. After wandering the empty streets for an hour, he finds his bedroll behind Things Found and goes to sleep. If he survives the related quest, a whole new life awaits in Bliss, along with a brand new bedroll in front of the entrance to the Sacellum Arden-Sul. With no dogs to be found, Bhisha will instead pick up the life of a typical beggar and will spend the majority of his time strolling around the entire town. He will now eat for two hours at 5pm, worship as usual at 7pm and sleep between 10pm and 6am. Regardless of his location, he will always skip his visit to the Sacellum during Ritual of Accession. He wears a sack cloth shirt and pants and carries a tan cup and a piece of food. Bhisha has the disease Ataxia. "That's ridiculous. 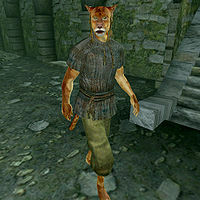 I understand there's a Khajiit beggar that follows him around, just to annoy him." "Bhisha is always following him around. Ushnar would do anything to stop it." Understandably, Ushnar does not speak of Bhisha in glowing terms when first meeting him: "Ew. You smell worse than that cat, Bhisha. Get away from me!" or "You haven't seen that filthy cat beggar have you?". If you enquire further Ushnar will persist: "He's still around. I've seen him skulking like the filthy cat he is." or "Yes, he's the one. Isn't he scary? I wish someone would just make him disappear." If you offer to help he'll reveal his murderous thoughts: "You would do that for me? I would do just about anything for you if you make him go away. Permanently. For good. Never to be seen again." On subsequent meetings he'll be ever more worried: "That cat beggar is following me! He's going to eat me, I just know it. Don't look! He's standing right over there." 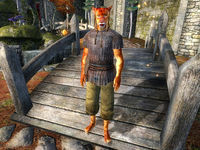 Should his dog die, he will admit that the respite from Bhisha's attentions is likely to be temporary: "My dog died, so that Khajiit isn't following me right now. However, I'll be getting a new dog soon, and I just know he'll be back." When the dog-obsessed cat notices you or others, he will spontaneously utter: "I'm so full. Not the least bit hungry." or, more importantly, "I like Ushnar's dog." If you talk to him, he will say: "I like dogs. Dogs are pretty." Talking to Ushnar will reveal the problem. The big Orc is afraid of cats and Bhisha likes dogs, in particular Ushnar's Dog. Ushnar is in a state of panic and will say: "That cat beggar is following me! He's going to eat me, I just know it. Don't look! He's standing right over there." You can offer to help Ushnar get rid of Bhisha which will cause Bhisha to comment: "He has a nice dog. I like dogs." Three options are available. The hesitating answer 'uh yeah' will just cause Bhisha to say: "You like dogs too? That's nice." You can also order him to leave Crucible, which will make him ask: "Why should I leave just because you tell me to?" If you raise his disposition above 90 and ask him the same question, he will leave voluntarily: "My best friend wants me to leave? Okay, for you I will. I know a nice spot in Bliss I can use." The third option is to hand him 200 gold, which will make him leave as well: "I wonder if there are nice dogs in Bliss. I think I'll go see." When you exit conversation, he may add: "You're no fun. I bet you don't like dogs." Some additional dialogue can be heard as well; if you have completed the Main Quest, Bhisha will greet his lord with: "Please do make it rain burning dogs." and exit conversation with "I'm off to find a dog." If you persuade him to leave town, he will instead be more humble: "Lord Sheogorath wants me to leave? Okay, for you I will. I know a nice spot in Bliss where I can stay." Also, if you go for the more unusual approach, as hinted by Sickly Bernice, and steal the dog food from the Ushnar residence, Bhisha will accept it with gratitude: "You're giving me free food? You're a good friend. Thank you. ", even if it means Ushnar will make his dog attack him. Lastly, should you decide to dispose of the dog, Bhisha will be quite sad: "Such a pretty dog. Dead, dead, dead. Ushnar is sad. I heard from Bernice that Ushnar might get another dog, a new dog. Maybe Ushnar will let me pet him." Due to him being homeless, his eyes and ears will prove helpful during a few other quests as well: During The Lady of Paranoia, Bhisha will, with some painful persuasion from Herdir, tell you what he knows: "I don't want trouble! I keep to myself, but I see Ma'zaddha and that Dark Seducer, Nelrene, meeting behind the buildings late at night sometimes. That's all I know. Nothing more." During the Falling Awake quest, Bhisha will also provide some suggestions which may help Amiable Fanriene sleep: "Go talk to Uungor. He's always talking about leaving, anyway. Your friend can sleep where Uungor does now. Get him to leave sooner than later, and your friend can sleep sooner than later. Watch it, though. Dogs don't like the smell of him." Bhisha is the only NPC to have two possible epitaphs to show up in New Sheoth Graveyard. This page was last modified on 22 June 2018, at 04:46.